Athlete Daily posted this quote some time ago and I gave it an ‘amen’. Anytime someone asks me to help them on their nutrition, my first question is what are you eating. The typical response I get is I don’t eat very much, but I can’t seem to lose any weight. If you aren’t tracking your food then how do you know you aren’t eating much? If you aren’t tracking your food how do you know how many carbs, protein, or fat you’re eating? You could be overeating or underrating and never know it. What I love about flexible dieting, is it is not really a “diet”, it is just how I eat. I could have cake everyday if I wanted to. I could eat chicken fingers, a double cheese burger…anything my stomach desired, as long as it fit into my daily macros. No restricting myself because it is a starch or a fat, I just eat real food that fits into my macros for the day. Flexible dieting is a life style choice, but it takes effort. You can’t just say, oh I am going to cut out all carbs or fat, you have to calculate your daily intake of ALL the food you consume. You have to stay on track and think ahead to know what you can fit into your daily macros. Lots of people have lost weight on the no carb/no fat diets. That is great for them, but I do not see how a diet that cuts out an entire food group is good for your body or how it is sustainable over the long haul. Carbohydrates and fat are at every family/friend function, on every fast food menu, at every fancy restaurant…unless you stay home for the rest of your life, you will encounter these food groups. You need to know what is in your food in order to make smart choices. Carbohydrates and fats are not bad foods, if you know how to moderate them. Maybe it is that it takes more effort to calculate and make recipes, rather than just cutting out any food that is white. I can’t deprive myself of any food group, so I calculate and make choices from there. You have to be smart about the foods you choose to eat. Just because you can eat all the food groups, doesn’t mean you should go overboard everyday or make unhealthy choices. If you choose to eat a bag of chips instead of broccoli, be prepared to be hungrier a lot sooner. 148 grams of broccoli has 10 grams of carbohydrates vs. 28 grams of Lays Kettle Cooked Chips has 17 grams of carbohydrates. That is big difference in the volume of food you are eating vs. the amount of calories/carbs they have in them. The amount of food you are filling your stomach with matters and the amount of calories that food has is even more important. You want to have foods that are high in volume but low in calories in order to keep you full longer. 1/4th a cup of raisins has around 100 calories vs. 1 cup of grapes, for the same amount of calories. The raisins are obviously smaller, a smaller quantity, and will not keep you full for very long. My rule is just not to eat processed food. I eat real food. Food that expires. (Halo Top and dark chocolate don’t count as processed food in my eyes. those are my “treats”.) In our house we mostly eat food that requires you to wash it. If you looked in our buggy at the grocery store, you would not see very many foods that are packaged in boxes or bags. I try to cook with raw ingredients and my snacks are the same. I do not snack on chips, candy, or Little Debbie anything. Snacking is where most people get into trouble and rack up most of their calories. A lot of food choices we make are out of habit, bad habits or lack of willpower. 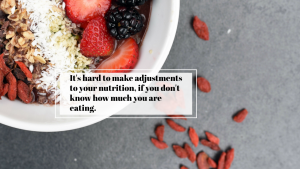 Once you start creating new healthy habits, like weighing and tracking your food, the healthier options should naturally come. You will see that you get more bang for bite if you choose high volume, low calorie foods. No one wants to eat tiny portions and feel hungry all day. With all the upcoming festivities for Thanksgiving, a few easy nights of cooking are definitely needed. I am going to opt for some grilled options since we have the whole week off and grilling won’t be an issue for us. You can always meal prep hamburgers. We have discovered that Scarlett is obsessed with venison burgers, so we are going to make sure we meal prep these for her regularly. We do not put any eggs or breadcrumbs in our patties and they stick together just fine on the grill. We literally only have the meat and seasonings. Josh likes to put fennel seeds in the spices and it adds a nice touch to them. Don’t be afraid to mix it up with the spices. Hamburgers get a bad wrap, but if you take the time to pick a low calorie low carbohydrate bun, skip the mayo, bacon, and cheese you will have a healthy, easy meal. I usually have two burgers, but always make my second hamburger as a lettuce wrap. Salmon is by far my favorite fish and it’s like a treat every time we cook it. I never order salmon when we go to restaurants. It’s like ordering a steak, you can always cook it better yourself at home. I have tried lots of different fish, but salmon just never disappoints. We use lemon zest and lemon slices, salt, pepper, Tony Chachere’s, onion powder, and garlic powder. We wrap the fish in tinfoil and cook it on the grill. You can cook your entire meal on the grill which is great. For the asparagus, we use a ventilated pan for the grill, drizzle the asparagus with a little olive oil and season with salt and pepper. Cook the burgers at the same time and you are golden! This is the easiest way to cook a prime rib and I swear by this method. If you want a perfect roast, I am telling you/promising you, this method does not disappoint (but you have to follow it 100%). We like to use Pikes Peak Seasoning and rosemary on our prime rib. If you can’t get the Pikes seasoning, it has black pepper, sea salt, white pepper, red bell pepper, garlic, minced green onion, and parsley in it. We use this seasoning on our meat all the time, it is worth the purchase. I think with all the pies, soups, fried turkey, more pies, stuffing, etc. we could all use a little salad before the big festive day. This salad has a lot of great flavor and uses butternut squash, which is such a great fall staple. I am going to skip the olive oil in the dressing and up the amount of lemon juice and cider if it is too thick. Enjoy time spent with your family and all the Thanksgiving goodies, but remember to enjoy them in moderation. There is no sense is making yourself sick over a day of eating and regretting the food you eat. Have the turkey and pie, but get back on track. Make sure you have a light breakfast and lunch if you are going to splurge on dinner. You know what pumpkin tastes like, you don’t need 3 slices of it. Make sure you save some of that turkey for your salad the next day. I typically make this salad with grilled chicken, but leftover turkey will work just fine. I don’t use any oil for this salad dressing and it works out wonderfully. I use 1 cup of blueberries, opt for non-fat feta, and pick between almonds or avocado. With a few adjustments this meal is the ideal low calorie, high volume meal! I am beginning to be a believer and not ever using any oil in my dressings. It just doesn’t really need it and adds so many more invisible calories.